Using the ActiveX control csXImage to get images from an Access database and display a report. The Access demo provided has several images already loaded into the database. Most of these images are simple geometric shapes (squares, circles) in various colours. The 'Description' field contains an appropriate text string, e.g., "Green Square". A query has been set up in the demo to search for images where the Description field includes a chosen text string. In the example shown here, that query finds all images which include "Red" in the description. Note: Earlier versions of csXImage had a method called ReadBinary which has been replaced by ReadBinary2. ReadBinary is still supported for compatibility but it used a redundant second parameter to identify the expected file format. 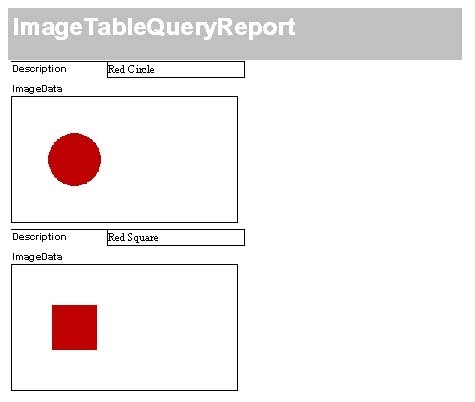 By modifying the query "ImageTableQuery" in the demo application, and by adding further images to the database, the results shown in the report can be modified.